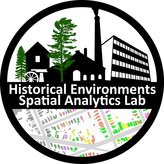 The HESAL is a community of scholars and community groups who work together using geospatial technologies to understand how environments change over time. Through a combination of citizen science projects, GIS and geospatial technology training, and community-driven research we examine how social, human built, and natural environments are impacted by the forces of industrialization and deindustrialization. Our expertise is in the development of big datasets, web-based and mobile GIS applications, and spatial analysis.